At the Albion shows on September 3 and 4, 2010, Skye completed her Open obedience title and is now Starr’s Light Up The Skye CDX RA! Skye completed her title with 2 first places in Albion and a second place at the Hamlin shows. Congratulations to Champ (Starr’s Great Save RA) who finished off his Novice Obedience title in Albion with a second place on Saturday. Other news from Albion: our Splash (Starr’s Splash Me Again) competed in her first shows and earned her first 2 legs in Rally Novice with 2 first places. Go Splash! On June 5, 2010 Team Starrdust will be participating in the AIDS Rochester walk at Genesee Valley Park! You can sponsor Splash and I by clicking here. 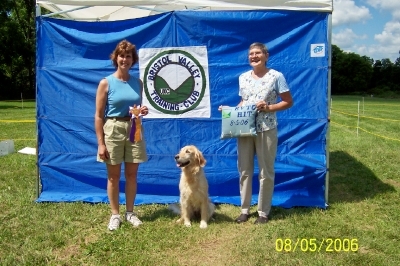 Congratulations to Maryanne and Annie and Tom and Jaina (both Mika/Chip pups) who earned their Rally Novice titles at the Sampson show 9/28/2007. 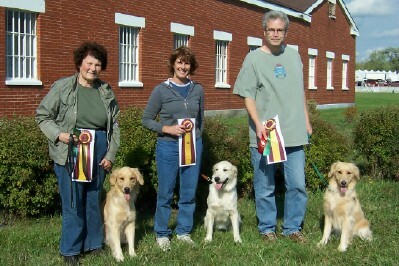 Maryanne and Tom are both new to obedience and what a great job both teams did with their training! We hoped their hooked on showing now! Also pictured, is Cari who earned her RN title also! Congratulations to Champ (Mika/River 2006) who earned his Rally Novice title at the Albion shows just after his first birthday. Champ is owned by my good friend, Nora, and is very special because he was born with a cleft palate and was raised by hand. Big news for Breeze who just passed her Canine Good Citizen test on 2/24/2007 at age 6 months. She is well on her way to becoming a Therapy Dog! 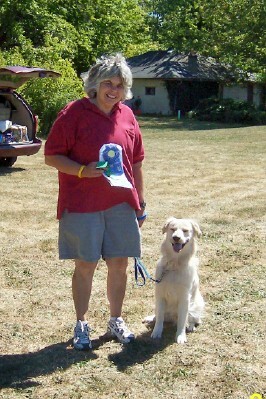 Congratulations to Diamond who earned her UKC-CD on August 5, 2006 with 2 first places and High in Trial! Diamond finished her CDX at Wine Country circuit shows on Septyember 28 and 29, 2006 with a first and second place. On Friday she was the only qualifying dog out of 15 entries-most likely because the ring was a muddy mess and she was willing to do a drop on recall in the mud! Now it is on to Utility…. Diamond also earned her first 2 Rally Advanced legs with second places each day and a near perfect score of 99 on Thursday! Aries also finished his Rally Advanced title during Wine Country! Mika finished her CD and Rally Novice titles at the Syracuse show in November!